We had received many requests from our members to have another visit to Ngong Ping 360 since the last time we conducted the facility tour two years before. It was our pleasure to have Mr. Eddy Wong, Cable Car Maintenance Manager, as our host to introduce us to the operations and maintenance of Ngong Ping 360. 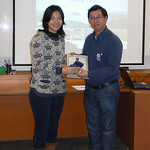 A presentation was given by Eddy to explain the development of the project. The whole project was developed whilst minimising overall environmental impact and preserving the North Lantau Country Park in mind. The usage of bi-cable gondola lift running between Tung Chung MTR station and the Ngong Ping village makes the cable car operation much more stable, in addition, it makes possible the selected cableway route and towers with minimal disruption and impact on Lantau's ecology. The participants also asked about the incidents which happened in the past, and the experience sharing was open and valuable. The case studies let us fully appreciate the importance of a good maintenance plan and management strategy for the project and the impacts made. Moreover, all of us were very impressed with the knowledge that some of their staff are required to train to be as fit as a fireman to secure and rescue customers when the cable stopped mid-way during breakdowns. 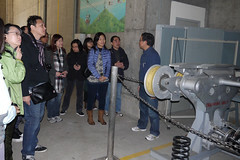 After the presentation, Eddy guided us on a walk around the working platform, the control room and the garage to show us how the cable car system works and operates. He further explained to members how to work out the daily inspection, repairing and maintenance arrangements for the system. We could personally touch a real 1:1 cable roller and the roll of gondola system inside the garage. Eddy told us that Ngong Ping cable car ride is visually spectacular, a 5.7km journey, the longest bi-cable ropeway presently in Asia. 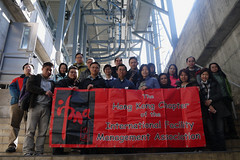 By the end of the visit, our IFMA members were offered a super discount to take the cable car to Ngong Ping Village. They carried out their own journey to visit the world's tallest seated outdoor bronze Buddha, the Tian Tan Buddha Statue, and Po Lin Monastery to enjoy a very fruitful and relaxing Saturday.